Based on the Tim DeForest article, Memorable Villains Collection features creepy and unforgettable villains in classic old time radio shows. In the best of these episodes, listeners doubt in the survival of our favorite old time radio heroes. Villains in this collection include Atom Man in the Superman serial, a Nazi villain so evil his nickname, Der Teufel, means "the devil" in German. Such a dangerous villain, his blood is made with Kryptonite making him an equal opponent to Superman. 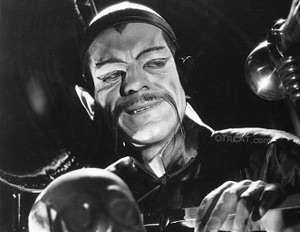 Other villains include The Shadow of Fu Manchu, so notorious and wicked he is the title character of the old time radio show. Sherlock Holmes may even be killed in "The Final Problem." A great villain offers an immense and almost insurmountable trial to the hero. In some cases, the nemesis are so nefarious and adept that we listeners remain unsure that our hero will prevail. Many are mad, many are bad, and all are great rivals to our heroes in the Memorable Villains Collection. See also Tim DeForest's article: Memorable villains of Old Time Radio. Be the first to comment on "Memorable Villains"